With all of the complications and commitments we all deal with every day, we can easily run out of time to deal with the basics. That includes everyday laundry. A lack of clean clothes can be a crisis, and at Clockwork Cleaners we are committed to helping you avoid garment catastrophes. With our fluff and fold service, we can help you take care of your everyday laundry and delicates. Fair, simple, and transparent! $1.50 per pound with a 10 pound minimum! No matter how busy you may be, you don’t have to drown in a sea of dirty clothes. Clockwork Cleaners will not only take care of the washing and drying, but they will also fluff and fold your laundry too. We handle everything, from sorting and separating your dirties, all the way down to matching your socks. Each item is washed and dried properly, and the whole batch of laundry is returned to you, wrapped up nice and tight. Fluff and Fold is a bulk cleaning service meant for your everyday laundry. We take special instructions based on your personal needs. We can use fabric softener, bleach or any other laundry fluid you might need. Whatever your preferences, our helpful team can help. 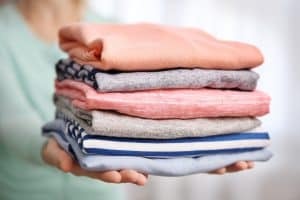 At Clockwork Cleaners, we also take care of a wide variety of more complicated garments as well as larger items like comforters, drapes, and curtains. Depending on the item involved, there may be an additional charge. If you have a question on pricing for a special item, feel free to reach out to us. We’ll get back to you as quickly as possible to discuss your situation.